The Ministerial Law Committee on Monday authorized for legislation a law that would regulate Bedouin settlement in the Negev. The law will legalize dozens of currently illegal towns and settlements established by Bedouin, while clearing dozens of others, requiring the removal of residents of those settlements. 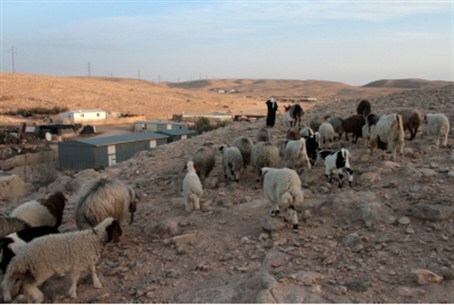 Many of the Bedouin living in illegal settlements are squatters who have been living on state-owned land for decades. The government has long sought a way to clear the Bedouin from state land, which is needed for security or development purposes. The new law will offer cash and land to Bedouin squatters who make a claim, even if they cannot provide evidence that they own the land. In order to qualify for the benefits, Bedouin will have to sign agreements that they have given up claims to the land they are squatting on. The plan is expected to require some 30,000-40,000 Bedouin to move from illegal settlements to the towns that will be legalized. As part of the legislation, a budget was provided for the hiring of 150 new police and security officers. The new positions came after a demand by Public Security Minister Yitzchak Aharonovich, who said that they were necessary to enforce the new law. The new hires will join 250 officers already allocated to clearing the illegal settlements.